"What have we hit?" asked Captain Smith. "An iceberg, Sir," replied first officer Murdoch. "We steered hard to starboard and reversed the engines full speed. But we were already too close. I wanted to go around the iceberg. But it was already too late." The news hit the world like a blow: "Titanic sinks four hours after collision with iceberg; 1,250 presumed dead." Thus read the New York Times headline of 16 April 1912. Only twenty-four hours before, an unprecedented tragedy had been enacted 400 nautical miles off Newfoundland in the Atlantic. More than hall the ship's passengers had died. marvel of engineering and as "unsinkable". Yet she fell victim to the vagaries of nature like so many expeditionary vessels that had sailed into perilous waters a century before. 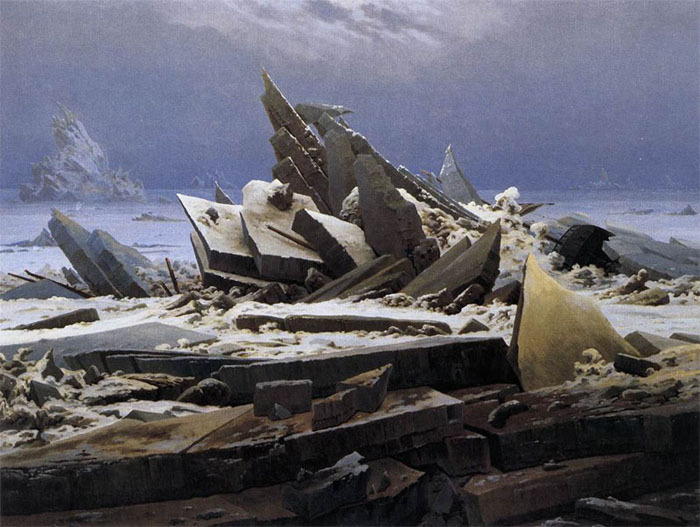 In Caspar David Friedrich's The Polar Sea, the capsized ship caught in the ice may be the "Griper", which took part in expeditions to the North Pole that made the headlines in 1819—20 and 1824. British Polar explorer Sir William Edward Parry had become embroiled in a very dangerous situation whilst seeking the Northwest Passage. Caspar David Friedrich may well have been inspired by newspaper reports about Parry as well as by heavy ice floes on the Elbe in the winter of 1820—21. The painting has occasionally been interpreted as having a religious meaning: the intransience of human life before divine eternity. There are also political interpretations: resignation in the face of the fruitless German wars of independence. And yet The Polar Sea remains in the first instance a symbol of the terrors of the icy wastes of the Polar regions - and of human presumption, which no longer stands in awe of nature.